Sorry, we are currently sold out of 'Unusual Chinese Writing Porcelain Bead Bracelet'. Please check back later. 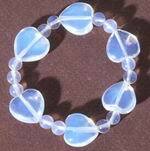 Sorry, we are currently sold out of 'Magnificent Aquamarine Bead Bracelet'. Please check back later. Sorry, we are currently sold out of 'Sensuous Red Coral Bead Bracelet'. Please check back later. Gorgeous Millefiori Bracelet - Explosion of Color! Sorry, we are currently sold out of 'Elegant Old-Gold-Amber Bead Bracelet'. Please check back later. Chunky Rainbow Mother-of-Pearl Shell Bracelet - Heavy!